A wayfinding system enables people to orient themselves and navigate from place to place with confidence. 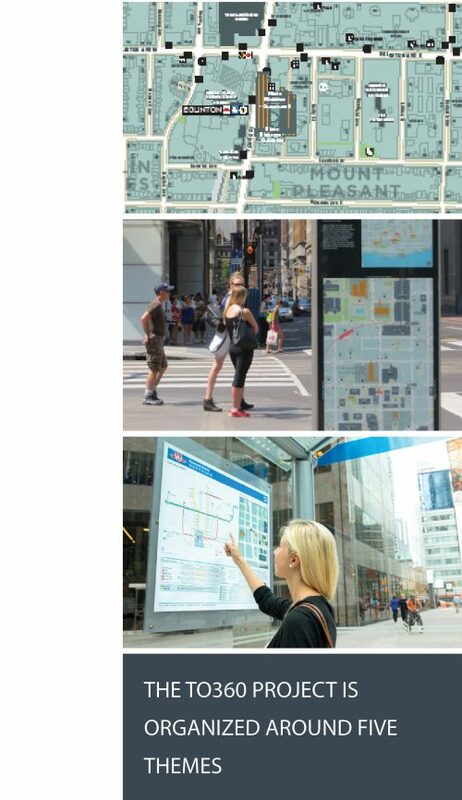 Wayfinding is more than signs – it includes the consistent use and presentation of information such as landmarks, neighbourhoods, destinations and connections that help residents and visitors navigate a city. 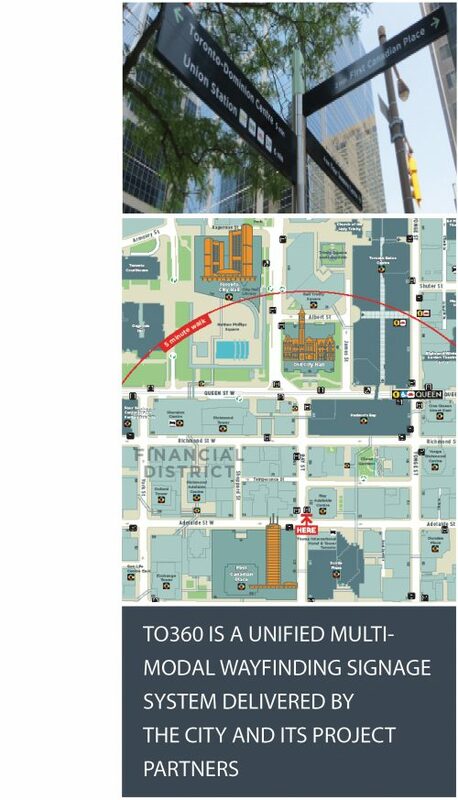 The Toronto 360 (“TO360”) Wayfinding project is a pedestrian wayfinding system which is a central component of the City’s ambition to make Toronto a more walkable, welcoming and understandable place for visitors and residents alike. TO360 provides consistent wayfinding information through a unified signage and mapping system delivered by the City and project partners. The City launched the project in 2011 with the development of a wayfinding system strategy for Toronto. A number of themes have been adopted through the detailed design and implementation process to ensure that system delivery is consistent with the project vision. The themes were informed by stakeholder consultation activities and by international best practices tailored to the context of Toronto. Local Identity – Celebrating and promoting the city and its districts. Empowering community input and participation. TO360 benefits residents, visitors and businesses alike. Wayfinding programs such as TO360 help residents and visitors orient themselves, connect places and neighbourhoods, and navigate the city with ease. They can increase confidence in walking, reduce walking times, help with route planning, and make transit connections easier. Wayfinding makes sense for businesses as well. TO360 maps encourage exploration of the city’s many neighbourhoods and attractions, which in turn can increase visitors at key attractions and boost the local economy. The creation of a multi-modal system is a goal of the City’s Walking Strategy. 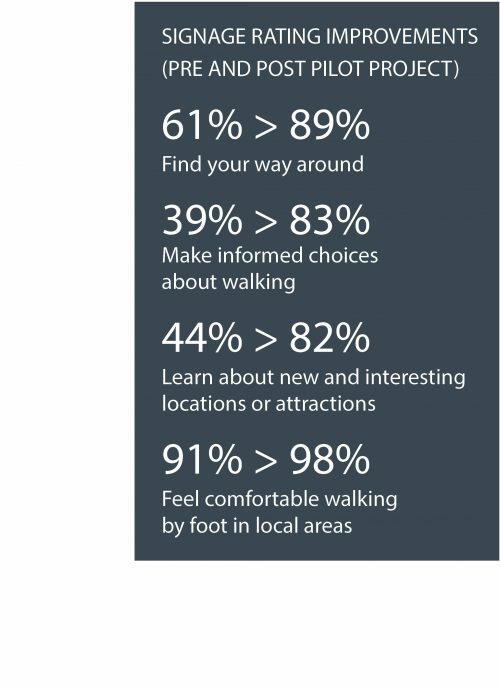 Wayfinding programmes encourage people to include walking as part of their journey, reducing pressure on the transportation infrastructure and making cites more healthy, vibrant places to live and work. The City conducted independent pre- and post-implementation surveys of the pilot project to evaluate the benefits of TO360 for Toronto. Respondents were asked to rate wayfinding signage in the pilot area based on a number of factors. The results of the surveys were positive and paved the way for city-wide implementation.